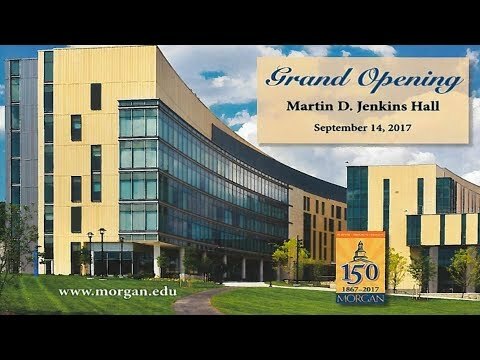 The new Jenkins Hall Behavioral and Social Sciences Center is the centerpiece for liberal arts education on Morgan State University’s campus. The university challenged the design team to create a building that would break down silos and learning barriers to promote interdisciplinary collaboration among a diverse student body made up of people from a wide range of cultural, ethnic, educational and socioeconomic backgrounds. Taking cues from the social sciences, the team prioritized the design of spaces that promote positive relationships between faculty members and the students. The building houses MSU’s economics, history and geography, political science, psychology, sociology and anthropology departments. Flexible classrooms, lecture halls, laboratories, a social science resource center, formal and informal collaboration areas, and administrative spaces support all five academic departments. A five-story atrium acts as the “living room” and central gathering place. On the first two levels are general-use classrooms for undergraduate student activities. Floors three and four include the instructional labs and graduate-level research spaces. On the fifth (and top) floor, an Instructional Design and Development Center serves as a think tank for national research on new pedagogies. The faculty wing includes all non-departmental space, thereby extending the idea of interdisciplinary collaboration. Offices are accessed directly from a main corridor with nearby meeting spaces, open collaboration areas and support spaces strategically located to encourage interaction. Graduate assistants and adjunct faculty also share open office space adjacent to student collaboration areas. The exterior architecture complements and respects the nearby campus buildings and adjacent residential neighborhood. Use of glass on the facade creates a feeling of transparency and puts classrooms and labs on display, welcoming the community. A new green quad improves pedestrian access to the rest of MSU’s West Campus. 145,000 sq. ft. / 13,470 sq. m.